"Easy egg-less, no-bake recipe! Best if refrigerated overnight and served chilled." Line a springform pan with aluminum foil. Place biscuits in a food processor and grind into fine crumbs. Blend in allspice. Press mixture into an even layer on the bottom of the prepared pan. Freeze biscuit layer until stiff, about 1 hour. Beat cream cheese, heavy cream, and brown sugar in a large bowl with an electric mixer until well combined. Stir hot water and gelatin together in a small bowl until dissolved; mix in mango puree. Transfer 1/2 cup of the mixture into the cream cheese mixture; beat until fully combined. Pour over the biscuit layer. Cover with plastic wrap and freeze until nearly firm, about 1 hour. 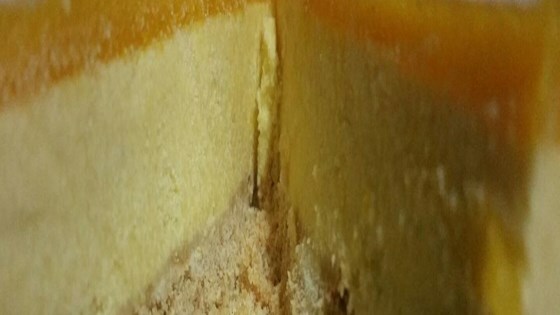 Pour the remaining 1/2 cup of the mango mixture over the cream cheese layer. Cover with plastic wrap and freeze until set, about 3 hours. Refrigerate for 2 hours to overnight. Gelatin can be substituted with agar agar powder for those who have restrictions.